Our approach is to give you financial advice that is tailored to your individual needs, giving you peace of mind about your financial future. Therefore we start by doing a thorough fact find to make sure we understand your individual circumstances and needs, as well as your objectives and aspirations for the future. Then, and only then, do we put together a tailored plan and recommendation on the right course of action for your individual needs. 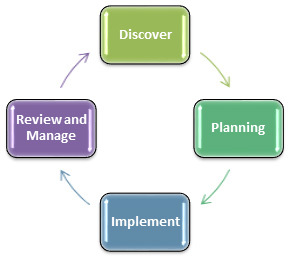 Our Advice process is a 4 step on going journey that begins with an initial consultation the Discovery meeting through to the Review & Manage which will always be the case as your personal circumstances change and evolve. A service contract given at the outset which includes details of the service you will receive and our cost structure.